100 pins per pack unless ordering quantities of 10, then 1000 per pack. The Foundation Pins™ are used to permanently secure the vapor barrier™ to the foundation wall. These pins are inserted into a 1/4" hole drilled by a hammer drill. 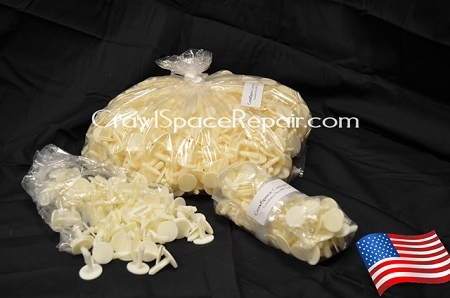 They are to be installed every two foot and are made of heavy gauge white plastic. These pins come in packs of 100 pieces and are required for a lasting bond the foundation wall. The heads of our pins will not break off nor will the pin come out of the hole as with other pins on the market. **Remember to figure enough pins for 1 every 2' and 2 in each corner, one for each wall about 2" out of the corner. It is not necessary to install Foundation Pins in concrete supports (piers). Definitely a great purchase. They worked perfectly. I just used a masonry drill bit with a regular drill and went into the mortar. I used these and adhesive for a good seal. I really love this site! It is informative and easy to navigate. You cannot beat this company for crawl space supplies! These were very easy to use! We used very little caulking with these for an extra seal. The videos were great help. Answered all our questions and were very useful over all. We couldn't have done this easy DIY project without them. We highly recommend these products. It took us a total of 12 hours spread over 3 days to complete our small crawl space, including clean out and leveling of dirt. And we're 55! Fast delivery, too. Our total cost was 1/5 of each of the 2 bids we received from basement experts. These are a must have! Use a 1/4 drill bit (Wood / Masonry) and hang the liner as you stick it to the double-sided wall tape. This prevents it from being pulled off the tape as you work your way down the wall. Our crawlspace was real nasty, so nasty and tight I couldn't get a contractor to take the job. Glad they didn't... I did it myself for cheaper and probably did a better job. The cement block in my crawl space was a little damp making the double stick tape not the best option. So after speaking with Larry he recommended going with the pins to secure the 12 mil and then the polyurethane caulk just above it to make a nice waterproof seal. As usual, Larry was right on the money and it worked great. I recommend getting one more bag of pins (or a tube of poly) than you think. It's better than having to reorder, pay shipping.and more importantly, having to stop your progress. We are completely satisfied with both the products and the service!! Easy to install. Great product. Definitely a great purchase. They worked perfectly. I just used a hammer drill with a masonry drill bit, drilled into the block as well as the mortar joint. It was real easy to do. I also used the Foundation Seal tape when I could get it to hold and the pins where needed. 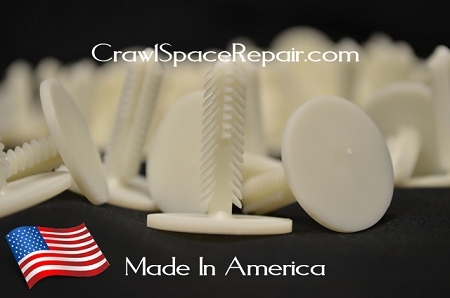 I purchased the foundation pins along with all of the other materials to encapsulate my crawl space. All of the products worked better that I expected and I accomplished the job with no assistance due to the quality. It is a real pleasure to use American made products again! Thank you for the help! Just wanted to send you a quick note to let you know how well the Foundation Seal Tape worked for my vapor barrier. After brushing the block and insuring they were dry, the tape stuck well and allowed me plenty of time to hang the vapor barrier and install the Foundation Pins. This barrier has been installed for a month now and I have had no problems with the seal. I would recommend the Foundation Seal Tape and Foundation Pins to anyone who is installing a crawl space vapor barrier. I was very pleased with the quality of these pins! There was a couple of them I really had to push on to get them all the way in and the pins never broke! Another great product. Great product, don't know if there is anything that comes close. I looked, and found nothing that will work as well. simple, affordable, effective, what more can you ask for? They work great, i wish they made some longer though so you can fit them through the foam insulation as well. Work as advertised and make putting up 20mil liner on the walls much more secure and professional. Use a professional type hammer drill (I used this project as an excuse to purchased a mid-level Bosch rotary hammer)and you will be done in no time. After inserting the pins by hand/thumb, I used my soft rubber mallet to give them a nice little tap. Be a pro and don't leave this step out. These pins hold very well in stone walls. You just pre-drill and push in by hand or gently tap in with a hammer. I will need to order more of these. These pins are easy to work with. Just by using a 1/4 drill bit to create the need hole, I could literally push the pin in with my thumb. It took no time at all to finish the perimeter of my crawl space. I've used them to attach the 20mil membrane to fondations sprayed with polyurethane and to my surprise, they worked great. Because the surface is so irregular, I would have needed twice as much as I thought. Couldn't find something as good at the store. They work as described and you will definitely need them to hold the vapor barrier in place. Don't rely on FST-100 Foundation Seal Tape alone. Absolute must to secure the vapor barrier to walls. The weight of 12 Mil SilverBack along a 5 ft wall pulled the Seam Seal tape off the wall even in an area that seemed well attached. From then on, I worked in smaller sections, reinforcing with foundation pegs every 1.5 to 2 feet. Taps in easily into 1/4 inch hole. The foundation pins were worth using. They were sturdy and after three months are still holding the crawl space together. They were also easy to install. Owner of home improvement & remodeling company. These pins are great! They have decrease our installation time by 15 to 20 percent. Pins work great! Wide head. Fast shipping. The foundation pins worked great. I installed one pin every two feet along the perimeter wall and within two inches of every corner. Three pins were installed on each 8x16 cinder block pier. They give a nice professional finished appearance. Don't try the installation without the pins! They work great and really save a lot of wasted effort. While the double sided tape is great, the weight of the barrier is enough to pull it down. Working in a low crawl space, I placed the tape around the perimeter with the outer paper intact. I then worked a few feet at a time with the tape and pins. Worked well for me! I am very happy with the result since we converted a vented space that was a nightmare into one that was actually pleasant to be in. It should pay in utility bill dividends over the next few years. Thanks for the follow up. Your products were more than what I expected, but I can't say enough about the excellent support I received from your staff. I'm hoping to use your products on another project I may have coming up soon. This is a great idea to help re-enforce the vapor barrier hanging on the wall. I have them about every 2 feet on my crawlspace walls and on every floor pier. The video showing how to install them was very useful. These pins work great. I overestimated the amount needed to do my job. They're very strong.
. All materials and supplies were as advertised. The foundation tape, the water proof seam tape, and the vapor barrier fasteners worked exactly as advertised. I could not have been more pleased with the products. Very sturdy, nice large, flat head, grip well. Head will not break when hammered like cheap ones. Definitely the pin to get for vapor barrier installation. These pins worked much better than I expected. I was most impressed with how well they hold on different conditions. Once I got the hang of drilling in a very tight crawlspace and keeping the mess down my project went fairly smoothly. This product along with the outstanding support and recommendations by the staff helped make my project a success. Everything we bought was just as expected. Great product, great service. The combination of the double stick tape and the pins worked well. The material looks great and made quite a difference. The pins are very strong and durable.